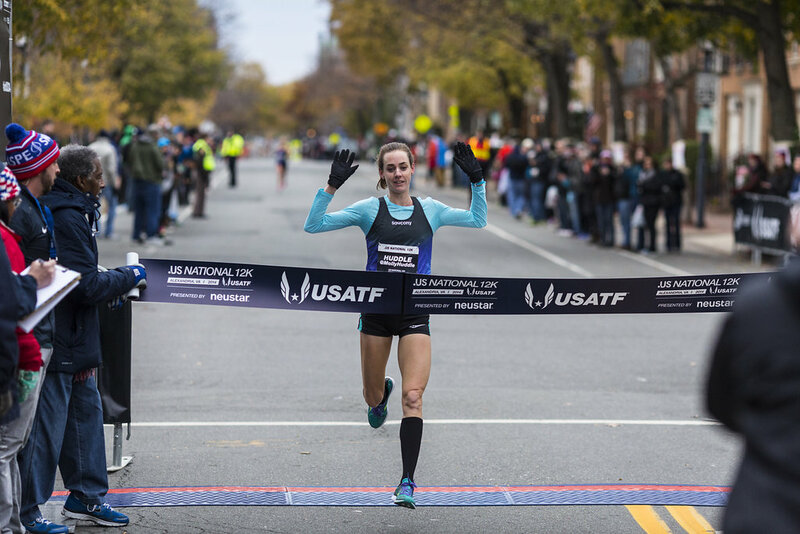 Molly Huddle won her record fourth U.S. title on the roads this year at the .US National 12k Sunday in Alexandria, running 38:08 to repeat as champion at that distance and of the U.S.A. Running Circuit. She won the inaugural 12k event last year in a world’s best 37:50. [button-red url=” http://www.national12k.us/Results.aspx” target=”_self” position=”left”] Results [/button-red]Her move in the third mile this year put distance on pursuers who included Emily Sisson (38:21), Kim Conley (38:42) and Sara Hall (38:48), all of whom were in striking distance after the race strung out from Huddle’s early pace. By 8k (25:31), she had a 13 second lead over the chase pack, which closed to a 10-second lead over Sisson at 10k (31:57) before she tacked three additional seconds onto her margin in the last 2k. Huddle plans to cut back on road racing early in the year to focus on 10k for the world track and field championships. She set the American Record in the 5k this summer at 14:42.64. Around toward the end of the third mile, Huddle opened up a one-second gap that strung out Hall, Conley, Sisson and Emily Infeld (sixth, in 39:13). By 5k , Infeld, a Georgetown alumna, had dropped back from the lead group. “I didn’t really know how it was going until halfway, when I knew people had fallen off, but most of the race I think I just had about a 10-second lead, so if I let up at all, that would go away quickly if I slowed at all,” Huddle said. Fellow Providence resident and Ray Treacy athlete Sisson, 23, is in her first season of road racing while in Providence College’s MBA program, and made her debut at September’s CVS 5k, the national championship, which Huddle won, and the Tufts 10k in Boston in October. She trailed Huddle by 10 seconds at 10k (32:07) but carried a 16-second lead over Conley and Hall. Huddle felt that Sisson was capable of this kind of race after her recent workouts, but Sisson herself was trying to avoid any lofty goals early in her road racing career. After winding through the streets of Old Town Alexandria last year, the 12k course followed the George Washington Parkway south before turning back. That cut down on the turns around which runners could make moves and surprise pursuers, but also gave runners a look at the lead they held. Third place finisher Conley, 28, saw the new course as a challenge. She ran 39:29 last year for fourth place. Conley, of West Sacramento, Calif. was hoping for a slower pace, but held on when Huddle took control from the beginning and battled Hall, 31, of Flagstaff, down the finishing stretch on Union Street. She was a 2012 U.S. Olympian in the 5k, but is adapting to longer distances as she shoots for her half marathon debut in Houston this January. Infeld, 24, of Portland, Ore., watched several Hoya teammates and alumnae race last year while she waited for a diagnosis for an injured back that turned out to be a sacral stress fracture that took her out for six months. She had finished second to Huddle twice in fall 2013, at 5k and 10k. Eugene, Ore. runner Alexi Pappas, 24, could sympathize. She is beginning her competitive season, like Huddle focused on the 10k in 2015, and saw the confluence of runners’ seasons play out on the GW Parkway. She wound up eighth in 39:49, a fair result from a converted steeplechaser. The race field got her motivated for her nascent season. Frances Koons, 28, of Laurel, Md. was the only local elite runner in the women’s race and she, like Pappas, is getting into the swing of things. She finished 15th in 40:36. In April, she finished third in the U.S. 10 Mile Championships, held in conjunction with the Cherry Blossom Ten Miler. She recently moved to Maryland to teach and coach at the Sandy Springs Friends School in Silver Spring. Though her school lacks a track, she’s training on the school’s 140 acres of grassy fields and soft trails and on a roughly one-mile paved path in a nearby neighborhood. “I’m getting faster when I run it, whatever distance it is,” she said. 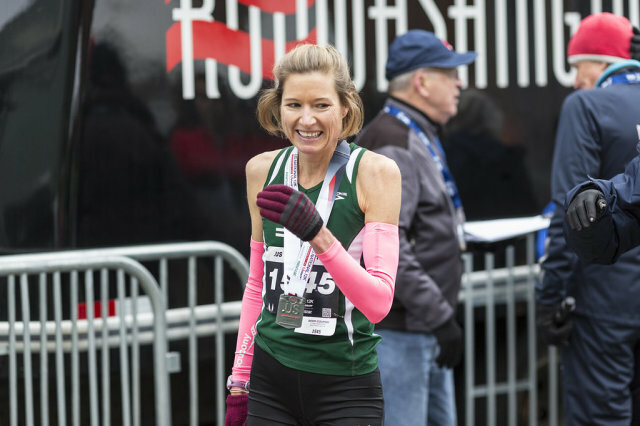 In the masters championship, Perry Shoemaker of Vienna, Va. triumphed in 42:54 comfortably over Chapel Hill’s Alexandra Bigelow (46:24) and a runner from Freeport, Maine named Joan Samuelson.